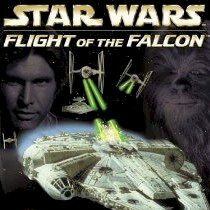 Are you ready to take control of the Millennium Falcon? Shoot with your primary turrets and destroy all incoming ships. Use a limited weapon to make a huge explosion if you get surrounded. The Millennium Falcon is an ultimate ship, that has an incredible story. Do you want to fly on it? This game gives a perfect chance for you to fly on the legendary ship and destroy your enemies in the space battle. Move from side to side and point your crosshair on the enemy and shoot. Use missiles when you want to make a big explosion.